Students of Resonance Commerce & Law Program Division (CLPD) Kota, Jaipur & Indore Centres performed exceptionally well in CA-IPCC (May-2017) results, declared by the Institute of Chartered Accountant of India (ICAI) on 01st August, 2017 at 4:00 p.m. 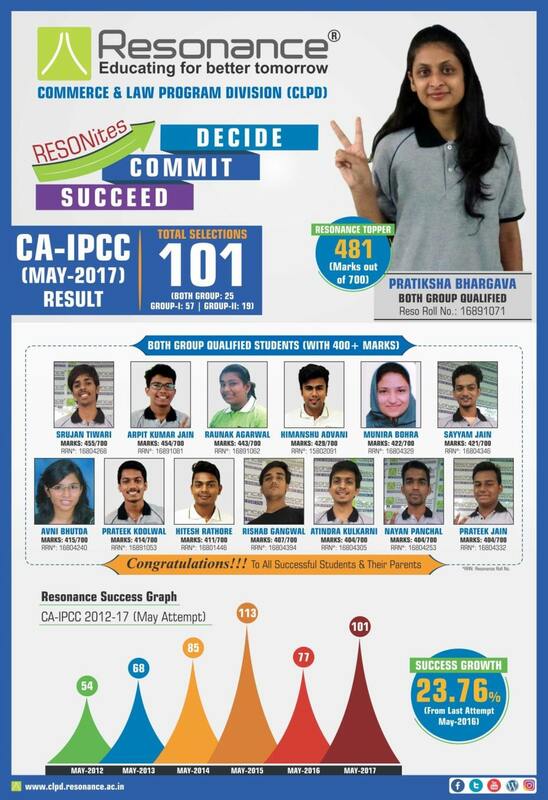 In CA-IPCC (May-2017) Result Resonance CLPD students performed brilliantly. Total 101 Students got selected in the Exam. Total 25 Students Cleared Both Groups in which PRATIKSHA BHARGAVA secured 481 marks and topped the institute. Further total 57 students successfully qualifies Group-I and 19 students successfully qualifies Group-II. Managing Director of Resonance, R.K.Verma congratulates all the successful students and wish them Luck for their Future Endeavour.